Mythic, worshipped in ancient Greece, dates vary, beginning circa 500 B.C.E. The Cumaean Sibyl was the priestess and prophet of the god Apollo’s oracle at Cumae, a Greek colony. 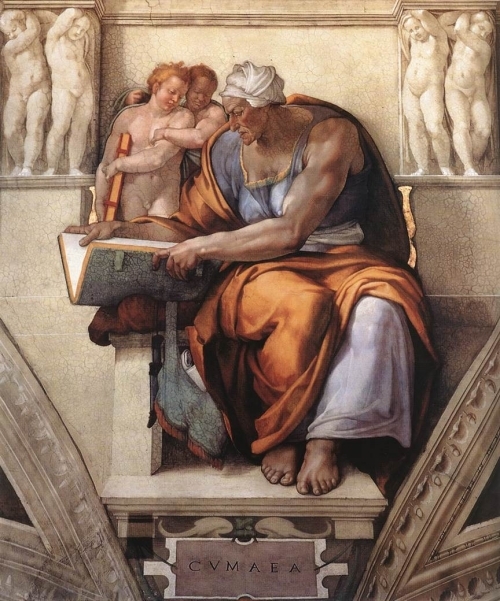 The most famous legend of the Sibyl involves her nine prophetic books, which contained knowledge that Lucius Tarquinius Superbus, the semi-legendary last king of early Rome, sought to procure. He thought the price was too high, so the Sibyl threw three of the books into the fire and made a second offer, but Lucius declined again so she burned three more. Eventually he bought the remaining three books, according to some accounts for the original price, but others claim that the Sibyl doubled the price with each offer. The Sibylline Books were kept on the Capitoline Hill in Rome, but were destroyed in 83 C.E., when the temple that housed them was burned in one of the many wars of the time.